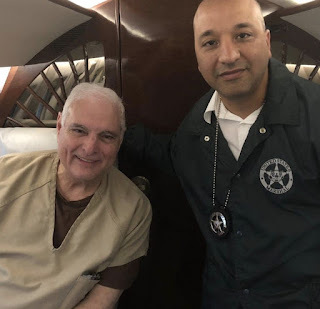 Sources in the Republic of Panama have advised that the country's fugitive former president, Ricardo Martinelli, said to have been the most corrupt leader the country has even known, is being extradited from the United States, arriving in Panama City sometime later today. He faces charges of embezzlement, and of conducting an illegal surveillance program upon prominent Panamanians. Martinelli has been held in Federal custody, in a facility in Miami, while his appeal of an adverse ruling regarding his extradition was pending, but he recently abandoned that appeal, allowing the Secretary of State to order his extradition. WHY DOESN'T ANTIGUA DEPORT ASOT MICHAEL ? WILL MOSSACK AND FONSECA CHEAT JUSTICE ?